This is the name of the place I was hearing from a long time now from my friends residing in Malleshwaram. Finally, I decided to give a try and ya I was happy that I went there. It is a small condiments store but also sells Tiffin menu of local choice. It’s been here for a very long time and you get to see people coming in big fat cars too to munch the food here. It’s really good to see that people do give more importance to the taste of food rather than the place. 1. Be ready for a sinful delight as they provide dollops of butter in this place for all the menus. 2. Forget about sambar. It is not served in this hotel. Chowchow bath is more in demand here and this place also serves, Idlis, Vadas and also Shavige bath. If you love sambar don’t feel down that it is not served here, they actually have something better than that – butter. It is served here unlimited but ya on extra cost which is not costly at all. 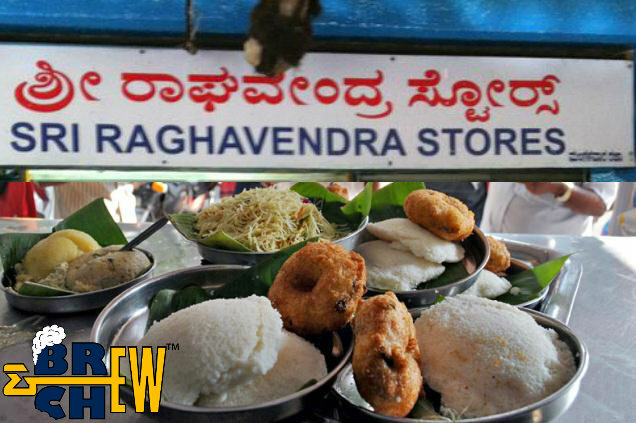 So just go here and enjoy the typical food along with a hot cup of coffee, tea or badam milk. This is a place which doesn’t burn your wallet and actually makes your taste buds jump for joy. So just go and have fun.